10 Days Shira Route | . The Shira Route approaches Mount Kilimanjaro from the west and begins at Shira Gate approximately 9,000ft. 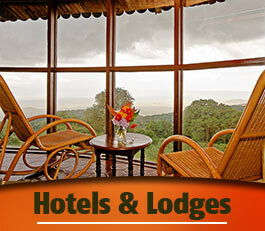 We begin your trip the next day from Planet Lodge Arusha. Just to let you know that the next morning, a 4×4 vehicle will drive us through a rich, lush rainforest until we arrive at the ridge of the Shira Plateau where our climb start. We trek across an alpine plateau and traverse Southern Ice field before summiting from Barafu Camp. The total time on Mount Kilimanjaro will be 7 nights 8 days. Arrival in Kilimanjaro International Airport, Meet and assist at the airport and after going through Immigration, Baggage Claim and Customs, Transfer to Planet Lodge Arusha in order to stay overnight at on Bed and Breakfast basis. We will gather in the evening for a pre–climbing briefing and climbing equipments check. We will also confirm that you have the appropriate mandatory medical coverage and travel insurance as well. 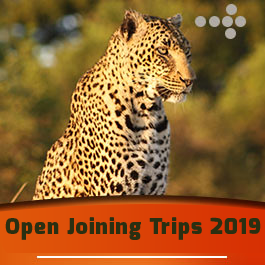 After breakfast, we take ride to Londorossi National Park Gate in order to complete the necessary registration formalities before we drive a short distance to Shira Gate (9,200 ft) where we begin our trek. We continue climbing steadily on foot through shrub forests and stands of giant heather to reach the rim of Shira Plateau (11,000 ft). The views across the surrounding plains open up as we approach our first camp, Shira one Camp (11,600 ft). It takes about 4–5 hours walk. Today is an easy day to help acclimatization and to explore the grassy moorland and volcanic rock formations of the plateau. We walk to the summit of Shira Cathedral (12,300 ft), a huge buttress of rock surrounded by steep spires and pinnacles. There is a tangible sense of wilderness here, especially when the afternoon mists roll in. From our camp near Shira Hut (12,600 ft), we take in the unforgettable views of Mount Meru as she floats among the clouds. It takes about 4–5 hours walk. The morning walking is a steady climbing away from the moorland of Shira Plateau to reach the broad upland desert beneath the Lent Hills with expansive views in all directions. After having lunch in our camp close to Moir Hut (13,800 ft), there is an option of a more strenuous afternoon walking to reach the summit of the Lent Hills (15,400 ft). We can explore the area beneath the Northern Ice fields, a remote place rarely visited by tourists with unusual views of Kibo Peak. Few visitors get to this remote corner of Mount Kilimanjaro. It takes about 5–6 hours walk. Let us enjoy a morning of gentle ascent and panoramic views, walking on lava ridges beneath the glaciers of the Western Breach. After lunch at our campsite based in Lava Tower (14,900 ft), there is a steep but spectacular afternoon walking on the rocky lower slopes of the Western Breach on Mount Kilimanjaro. This afternoon excursion is highly recommended especially for acclimatization purposes and for the superb views of hanging glaciers on both sides of the Breach. It takes about 5–6 hours walk. A steep descent into the bottom of Barranco Valley (12,800 ft) leads us to the famed Barranco Wall and its steep climbing. 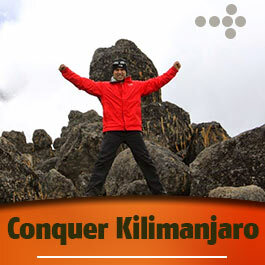 At the top the undulating trail crosses the flanks of Kibo Peak with superb vistas of the Southern Ice fields. The terrain is volcanic scree with pockets of vegetation in sheltered hollows and a powerful sense of the mountain wilderness. 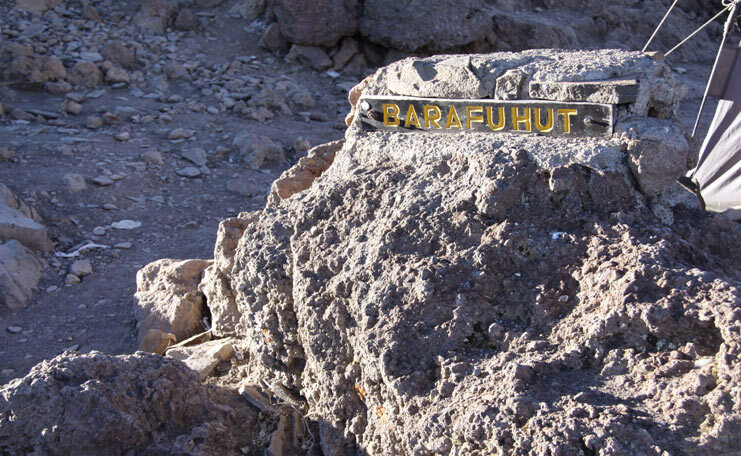 Our next campsite will be Karanga Campsite (13,100 ft), the last water point on the approach to Mount Kilimanjaro Summit. It takes about 5–7 hours walk. After morning breakfast, we all follow an easy path on compacted scree with wide views that gains altitude unrelentingly to reach Barafu Hut (14,800 ft) for lunch. There is a short acclimatization hike to the plateau at the bottom of the southeast valley (15,700 ft). The remainder of the day is spent resting in preparation for the early morning final ascent. It takes about 4–5 hours walk. We will start our ascent by torchlight about 1:00am so that we can be up on the crater rim by sunrise. The steep climb over loose volcanic scree has some well–graded zig–zags and a slow but steady pace will take us to Stella Point (18,800 ft), in about five or six hours. We will rest there for a short time to enjoy the sunrise over Mawenzi Peak. For those who are still feeling strong can make the two hour round trip from here along the crater rim to Uhuru Peak (19,345 ft) passing close to the spectacular glaciers and ice cliffs that still occupy most of the summit area. The descent to Barafu Hut is surprisingly fast and after some refreshments, we continue to descend to reach our final camp, Mweka Camp (12,500 ft). It takes about 11–15 hours walk. After breakfast, proceed with a sustained descend on a well constructed path takes us through a lovely tropical forest alive with birdsong and boasting lush undergrowth with considerable botanical interest. Our route winds down to Mweka National Park Gate (5,400 ft) and on through coffee and banana farms to Mweka Village where you will be transferred back to Arusha town. It takes about 5 –6 hours walk. Stay overnight at Planet Lodge Arusha or similar in order to stay overnight at on Bed and Breakfast basis. Price cost US$ 2,420 per person. Price cost US$ 2,315 per person based on a group of 5 people.